Fred Schumacher shares this awesome photo he shot from the air of the sun shining on Friday Harbor. Be sure to click on it to see a larger version. Thanks for sharing Fred! Mother Nature Loves Friday Harbor – Or, at least it looked like it Monday evening from a Kenmore Caravan heading North to Orcas. 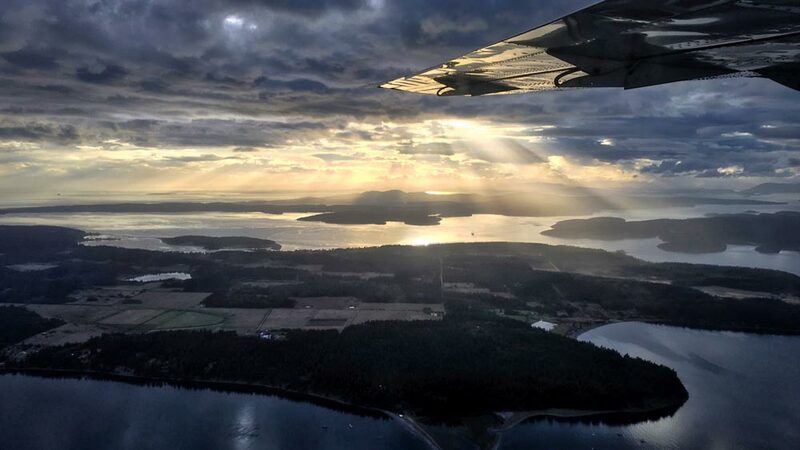 With Lopez in the foreground, sun rays were perfectly positioned to bathe San Juan Island in a heavenly glow. All my camera gear was bagged up behind the safety webbing, so my iPhone saved the day (evening).